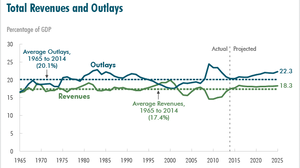 January 26, 2015  The federal budget deficit will fall in 2015, the sixth consecutive year of decreases relative to the overall economy, according to new figures by the Congressional Budget Office. September 30, 2013  The Democratic-led Senate is expected on Monday afternoon to reject the latest plan from the Republican-led House. With a midnight ET deadline looming, it's looking as if a partial government shutdown can't be avoided. March 27, 2013  Employees will have to take 14 unpaid days off over the next few months instead of the 22 the Pentagon had originally estimated. February 25, 2013  The political stakes are high for both Congress and the president, while some GOP governors are turning up the heat on House Speaker John Boehner. 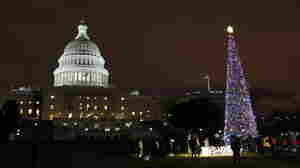 February 5, 2013  The Congressional Budget Office expects 1.4 percent growth this year, down from 2.3 percent in 2012. The nation's unemployment rate will likely stay near 8 percent this year. 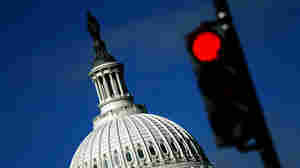 January 23, 2013  The "No Budget, No Pay" act would withhold lawmakers' pay if they don't pass a new budget by April 15. In exchange, Republicans say, the borrowing limit would be extended into May. That would avoid another battle over raising that borrowing ceiling. January 22, 2013  Republicans, who control the House, plan to vote Wednesday on a debt limit extension that's tied to a call on the Senate to pass a budget that includes cuts in spending. November 13, 2012  Virtually everyone agrees that allowing the nation to fall off the so-called fiscal cliff would be a bad thing. 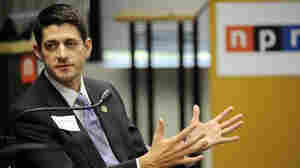 Government programs would be cut, taxes would rise, and experts say the economy would fall back into recession. And after all that, the nation still would be dealing with a budget deficit. August 22, 2012  The nonpartisan analysis arm of Congress has released its latest forecasts on the budget and the economy. 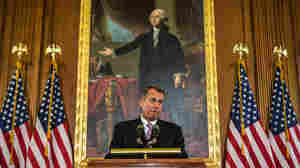 March 20, 2012  Critics are already taking shots at the latest plan from House Republicans. December 14, 2011  Once again, Democrats and Republicans are at odds over taxes and other issues — and extensions of programs including benefits for the long-term unemployed are being delayed. They're "stumbling from impasse to impasse," the Los Angeles Times writes. Superfailure Looks Likely; Then What? November 21, 2011  Brace for a negative response from financial markets and prepare for more political battles in the coming year if the so-called supercommittee concedes later today that it couldn't agree on how to cut future budget deficits. November 18, 2011  Republicans said it's time for the federal government to follow the lead of 49 states. 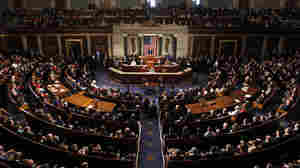 Democrats said the amendment would tie future lawmakers' hands. To move forward, the amendment needed a two-thirds majority — 290 votes. The vote was 261-165. 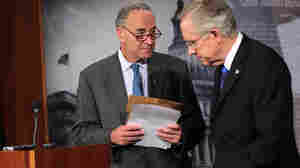 Left to right: Sen. Charles Schumer (D-N.Y.) and Senate Majority Leader Harry Reid (D-Nev.) at a news conference on Capitol Hill today. October 5, 2011  "In the eyes of many, it is hard to ask more of household that make $250,000 or $300,000 a year," says Sen. Chuck Schumer (D-N.Y.) "They are not rich" in many parts of the country. So some Democrats are pushing for a tax on millionaires instead. September 27, 2011  Republicans say the impasse underscored why it's important to scrutinize government spending. Democrats say they stood up for important programs.